Right now I’m just making background papers to make other artsy stuff with. It’s a fun and calming activity. You should try it. Just take any paper, and fill it with colours! Spreading acrylic paint with a plastic card, doodling with crayons, writing words and covering it up again. Paint under my nails, on my pants, on the table, oh – paint on my socks too. 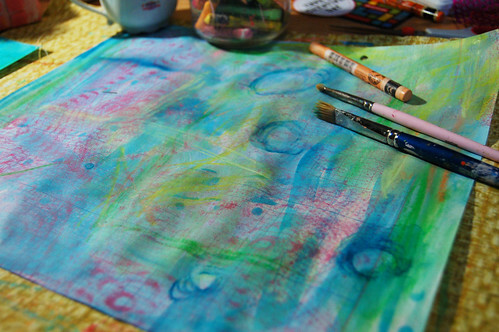 And even more background papers, crayon rubbings and all. This entry was posted in A Creative Life, Art Experiments and tagged acrylics, background papers, doodle, mark making, mindfulness. Bookmark the permalink. oh , those are beautiful, Hanna! Yay! I like doing that too! My favorite thing is to add a dash of metallic paint here & there. oh, i want to go swimming in these pages! just beautiful – your use of color is amazing! Gorgeous, gorgeous, gorgeous! I love this kind of play time! Ooooh. Beautiful papers. I can’t wait to see what you’ll be doing with those. And it makes me want to paint my own. I haven’t done crayon rubbings in forever! ooh isnt that SO MUCH FUN! I loveeee it. 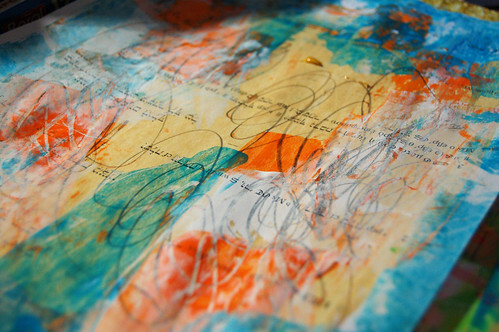 I get lost in throwing paint on paper. 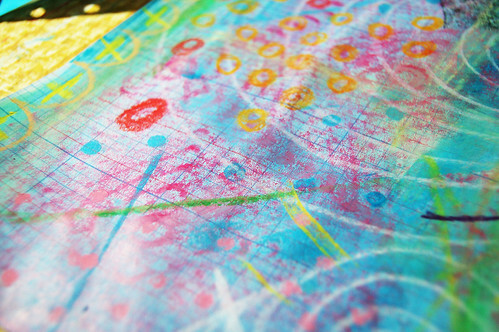 I love the second from the bottom with the crayon rubbing layered with the crayon resist swirls- great color combinations! 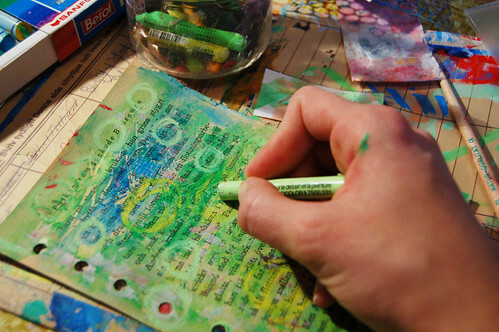 Yum…color is good for the soul…filling paper with it is good for so many reasons. Visiting your color was good for me today too, Lovely Hanna ! OK, so…explain about the socks!? Beautiful colours and pages in the making! And yes, paint under the nails (and all over the clothes) is now a daily occurence! fantastic! have a fairy nice spring! paint on your socks and every tshirt & jeans and… everything. love it. this is pretty. Hello! 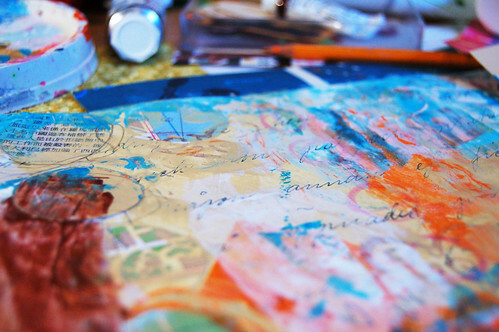 I come to your blog via Kelly Kilmer’s website, she featured it! Dang girl! 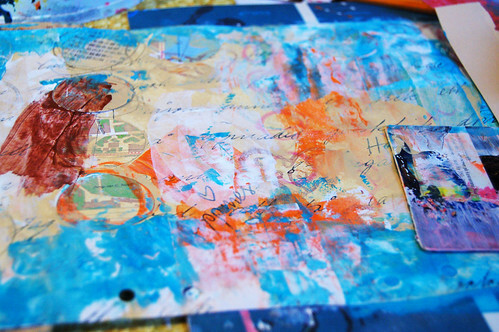 I am lovin’ on your blog and journals right now! I love the messy colorfulness of it! Reminds me of being a little kid and not having a care in the world… you inspire! Consider me hooked! Oh, dear, you’ve just made me want to doodle and paint, although I’m not generally a very good doodler (don’t allow myself to let go enough). Lovely background papers! Oh, Hanna, I am finally doing the journaling that I said I was going to do in Jan 2009. And I love it! You are right. I am fillilng pages with paint. Also, canvases. I posted a few pics on myblog, but I have done more work that isn’t posted. It’s SO not like me. But it must be me because I’m doing it! And it’s great. It frees you up and you don’t worry about whether you’re making it for someone else or if it’s perfect or what time it is or any of that. And after awhile, your mind just gets free and you find out exactly what you were thinking that you didn’t even know. Did I tell you you rock? I didn’t want to forget. I feel like starting now! It looks like fun, and they came out beautifully. But I know if I did it they wouldn’t be so beautiful. Maybe it would be a fun afternoon spent with the kids though! :) Thanks for the idea!